Writing good quality content if work like starting ranking of web pages then on page seo optimization works like speed up the ranking process. After doing proper keyword research optimizing web pages with keywords using all on page seo optimization techniques is very important to tell the search engines that your content worth start ranking. 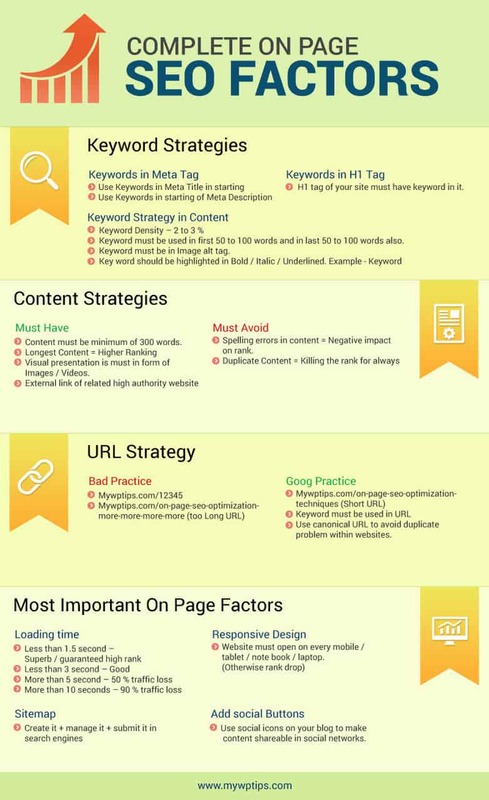 Here you will read all on page seo techniques in the mentioned checklist of all must have factors to to applied in your content with in a page. I can give you guarantee that you have never read all these complete on page seo tips earlier before reading this post here and no one has described it practically just like here. It is very important for us to make our url of the webpages with using keyword in it and i also adopt this method for making my URL search friendly. Here below you can read the example of what exactly this means and how much it is effective. For example you can see in the image below that for the keyword “SEO Tips” the website searchenginejournal.com is ranking on top position of Google and they have used the keyword in URL. Using keyword in the title of the post is really important and can be consider most important factor because this is thing which is to tell the search engines and as well as the reder also. Your title must be less than 60 characters and more than 40 characters atleast to make it proper for the readability of human and according to the rule of search engines. For this example you can see the above image and they used keyword – SEO Tips in title and ranking on the top. Remember 1 thing… starting title with keywords gives some extra value to your work and i always adopt this method on my blog posts. All users can watch video of on page seo tutorial in Hindi to do it in right manner. Meta Title – It should be same like title of the web page and with same strategy applicable to it. Meta Description – Using keywords in the meta description is really wise strategy and every one must consider it wisely and starting it with the keyword gives more value to your work. Again i will say see the above image as an good example of my words what i am saying. Meta Keywords – You should use your targeted keywords in meta keywords because it tells the search engines that for which search terms it has to rank your site. Write long content because it is not good sign for your blog for any short description on any topic minimum limit must be 350 words for any content to be loved by search engines. Use Keywords in 1st 100 words of your content because search engines crawler want to find that targeted search terms has been used in the content for the relevancy of search terms. Maintain the Keyword Density atleast 2 – 3 % to make it friendly to search and remember that do cross the limit more than 3 % of it because it shows that you have over optimized your content. Media rich content is now became very important for any web page and using keyword in alt tag with image is necessary to give the signals to search engines that used image is relevant with the main keyword of the content. When you apply this technique that there may be chance that your used images can be rank on Google images also and increase the posibilies to get traffic for your websites from image search engines also. You must check that with the desktop and laptop your website running properly on other devices like mobiles and tablets also because after recent updates from Google it has been clearly understood that website opening factor on multi devices is now became important part of on page seo optimization techniques and if any site is not running properly on all available devices then your ranking can be dropped in short time. It has been observed that those websites which got new content or which blog is updated with new content on every week or daily then they perform 50 % better in the search engines as compare to websites with few pages and updated one or 2 times in a year naturally. So try to add new content or web pages in your website or blog after every 2 – 3 days or daily then see the magic after 1 month without doing any extra effort in your web site. Webmasters know the profits of social signals in the seo and using social sharing buttons in the web pages or websites give some extra value because search engines consider that your website has the possibility be shared on social media sites or not. Therefore we strongly recommend you to use social sharing buttons in websites and social plugins in WordPress based blogs or portals and enjoy the viral promotion with increase in organic ranking also. Another most important factor if you are not serious about this then not only the ranking but your already got traffic may also loss. Loading time more than 5 second – direct loss of 50 % traffic and lowest conversion rate with already coming traffic. Loading time more than 10 second – My advice is to close your website and sleep at home. You can try some good website hosting like – Arvixe hosting for good speed and lowest downtime for your site. Use of the keywords in h1 and h2 tag is most important for the perfect optimization of the web page with keywords and if your content is really long than use in h3 tags also. When you use keyword any where in the content it is your duty to highlight it by making it bold, italic and underlined also as you can see that i also apply the same on page seo techniques on my blogs. You can try some of the best seo software also for better on page. You can check about Digital marketing Training in Agra UP.